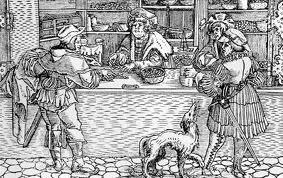 When money became an accepted medium of exchange, the need arose to keep the money safe. In addition, some people needed to borrow money. These needs led to the development of banks. The earliest banking records, dated around 2000 B.C., indicate that Babylon had a highly developed banking system. Babylonian banks were not unlike the banks of today, except that you might say they had a monopoly. Many years later, in the sixth century B.C., the first private bank emerged-the Igibi bank. The transformation of finance priorities has brought with it problems in administration. No sound project-appraisal system was in place to identify viable borrowers and projects. Lending institutions did not have adequate autonomy to choose borrowers and projects and were often instructed by the political authorities. In addition, the incentive system for the banks stressed disbursements rather than recoveries, and the accounting and debt collection systems were inadequate to deal with the problems of loan recovery. It became more common for borrowers to default on loans than to repay them; the lending system was simply disbursing grant assistance to private individuals who qualified for loans more for political than for economic reasons. The rate of recovery on agricultural loans was only 27 percent in FY 1986, and the rate on industrial loans was even worse. As a result of this poor showing, major donors applied pressure to induce the government and banks to take firmer action to strengthen internal bank management and credit discipline. As a consequence, recovery rates began to improve in 1987. The National Commission on Money, Credit, and Banking recommended broad structural changes in Bangladesh’s system of financial intermediation early in 1987, many of which were built into a three-year compensatory financing facility signed by Bangladesh with the IMF in February 1987. One major exception to the management problems of Bangladeshi banks was the Grameen Bank, begun as a government project in 1976 and established in 1983 as an independent bank. In the late 1980s, the bank continued to provide financial resources to the poor on reasonable terms and to generate productive self-employment without external assistance. Its customers were landless persons who took small loans for all types of economic activities, including housing. About 70 percent of the borrowers were women, who were otherwise not much represented in institutional finance. Collective rural enterprises also could borrow from the Grameen Bank for investments in tube wells, rice and oil mills, and power looms and for leasing land for joint cultivation. The average loan by the Grameen Bank in the mid-1980s was around Tk2, 000 (US$65), and the maximum was just Tk18, 000 (for construction of a tin-roof house). Repayment terms were 4 percent for rural housing and 8.5 percent for normal lending operations. Limited, the first private sector bank was incorporated in Bangladesh on 31st December 1981 as Arab Bangladesh Bank Limited and started its operation with effect from April 12, 1982. AB Bank is known as one of leading bank of the country since its commencement 28 years ago. It continues to remain updated with the latest products and services, considering consumer and client perspectives. AB Bank has thus been able to keep their consumer’s and client’s trust while upholding their reliability, across time. During the last 28 years, AB Bank Limited has opened 77 Branches in different Business Centers of the country, one foreign Branch in Mumbai, India and also established a wholly owned Subsidiary Finance Company in Hong Kong in the name of AB International Finance Limited. To facilitate cross border trade and payment related services, the Bank has correspondent relationship with over 220 international banks of repute across 58 countries of the World. In spite of adverse market conditions, AB Bank Limited which turned 28 this year, concluded the 2009 financial year with good results. The Bank’s consolidated profit after taxes amounted to Taka 3300 cr which is 43.44% higher than that of 2008. The asset base of AB grew by 27.20% from 2008 to stand at over Tk 10691 cr as at the end of 2009. The Bank maintained its sound credit rating in 2009 to that of the previous year. The Credit Rating Agency of Bangladesh Limited (CRAB) awarded the Bank an AA3 rating in the long term and ST-1 rating in the short Term. AB Bank believes in modernization. The bank took a conscious decision to rejuvenate its past identity – an identity that the bank carried as Arab Bangladesh Bank Limited for twenty five long years. As a result of this decision, the bank chose to rename itself as AB Bank Limited and the Bangladesh Bank put its affirmative stamp on November 14, 2007.The Bank decided to change its traditional color and logo to bring about a fresh approach in the financial world; an approach, which like its new logo is based on bonding, and trust. The bank has developed its logo considering the contemporary time. The new logo represents our cultural “Sheetal pati” as it reflects the bonding with its clientele and fulfilling their every need. Thus the new spirit of AB is “Bonding”. The Logo of the bank is primarily “red”, as red represents velocity of speed and purity. Our new logo innovates, bonding of affiliates that generate changes considering its customer demand. AB Bank launched the new Logo on its 25th Anniversary year.